I am a life-long football fan and historian of the NFL. I started reading about the game from a very young age and can remember reading the old Punt, Pass, and Kick series on NFL players from the 1960 when I was in 1st grade. Since then I have read hundreds of books, recorded thousands of hours of games and football shows for the better part of 4 decades now. Couple that with my life-long dream to coach and you’ll soon discover every nuance of the game I’ve studied and know every position. Those will come through when I expand my coaches corner to include formations and plays (many of which are personal design) that I’ll soon share. With Kevin Greene after the Induction ceremony. The reason for this blog / website is simple. To cover pro football from the perspective of a historian. I want to house in one website, the history of the game along with what is going on in the NFL currently. Too often when you follow ESPN and NFL Network there is a bias toward the glamour franchise when covering teams and making references to their contributions historically. Here everyone will be showcased. I’ll also share conjecture on what is changing within the game but not for the sake of argument, they will be fact based to start discussions to popularize new notions. Whether we’re talking a former player who should be in the Pro Football Hall of Fame or critiquing a team’s off-season moves. Above all, this is a place where former players and coaches are applauded for their efforts and contributions to the game. They’ll be covered in a dignified fashion that upholds what the game should mean to a future Jef Taylor who wants to learn about Pro Football. Free to do so without the tabloid, off the field nonsense that permeates many websites and television shows. They will be covered with journalistic integrity and from a positive light. The comments section will be respectful and without rancor. Everyone is celebrated for their effort not just the teams that win championships. So whether you’re a young Jef Taylor, a Mom who wants to learn a little football to share with her son or daughter, a father bantering with his son about a player from his youth being better than his son’s favorite player, or Grandpa who wants to share a story about players or teams from his youth, there is something here for everyone. This is a magazine where the Pro Football Hall of Fame merges with the contemporary NFL in one time and place. Complete articles with historic videos contained within. Some that haven’t been seen for over 30 years. Come one, come all!! Bring your friends!! Sit down with your favorite beverage and lets talk some football. Love the website. Agree with you 100% on glamour franchise over coverage. Keep up the good work. 1963 Bears best single season defense…..held Lombardi and Unitas to 20 total points in 4 games, YA to 10 in the championship, ( I take into account the low shot by Larry Morris), had to be the best, supporting an offense worse than 2000 Ravens and on par with 71 Colts. Bummer. Yes, I’m near old town. Ha! Did you hit me up in the fishing pond?? Hi, I was “fishing” and found you. lol Are you a Cards fan? Where are you watching last game tomorrow? Not a Cards fan… Stefani are you in Phoenix? Hey. how are you?? 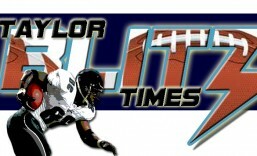 Welcome to Taylor Blitz Times… have a beer and enjoy. in desperate need of mp4 video of the 1972 afc championship game dolphins @ steelers (and the divisional game browns @ dolphins, if possible) for a big time project i am working on. there was a copy of a edited version of both games floating around on youtube and other places, but they have scrupulously disappeared. i had a copy of both before they disappeared, but my PC burned up, then the following week, the 2,000 GB external hard drive i had everything backed up on died! please let me know if you can help. Awesome site. I am interested in other photographs of John Riggins curtain call. Do you have more photos? I just have the video within the article. I actually took a still of that footage. Thanks! Thanks! Take a look around and put subjects in the search bar… 523 articles. This is one fantastic site! For the fans, by the fans. It’s refreshing to get away from those mainstream media types! You have my support! Greatly appreciated… I am def going to keep this going….